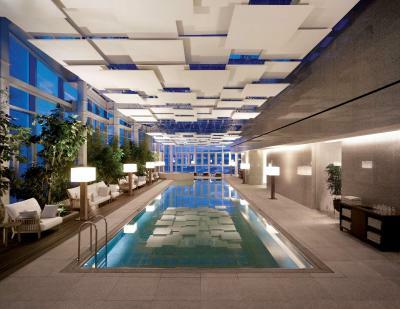 Lock in a great price for Park Hyatt Busan - rated 8.9 by recent guests. Amazing view from the room over the bridge. Comfortable bed. Nearby Starbucks, local coffee place and 7/11 for any snacks/quick breakfast. Lovely large bath with tv over it. Separate toilet from bathroom. 10/10 - everything was exceeding our expectations! Friendly staff willing to go beyond and above to accommodate our request, beautiful night view and the most comfiest bed ever :) will definitely visit again! 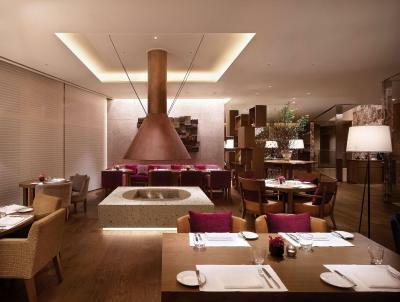 Being Park Hyatt, service was good. Laundry was done and delivered back promptly and folded very nicely. Enquiries were also handled very promptly. Loved the fantastic view of the room too. The interior designer surely did a good job. The view on the bridge from the 25th floor was quite nice. The room was fantastic and its location is not far from Centrum City by Taxi despite the bad traffic. The hotel was modern. I love the interior. I am OC when it comes to cleanliness and this hotel has lived up to my expectation. It is about 10 min taxi ride from the biggest mall in asia. Lots of restaurant around the hotel too. Value for money. 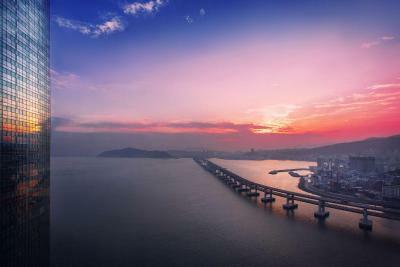 Breath taking view of Busan seashore and bridges. Love the facility and hotel. Great staff. Convenient to restaurants. I like most of the service that the hotel has done. Well done to all the staff, everyone was very friendly and helpful. 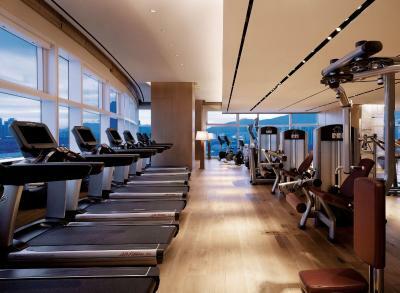 Located in Haeundae district next to Busan Marina and only 1.2 miles from Haeundae Beach, the 5-star Park Hyatt Busan features luxurious accommodation with exquisite rooms and suites. Boasting its sky lobby on the 30th floor, the hotel offers free WiFi and free private parking for guests. Featuring warm beige tones, wood and textile décor and French oak flooring, the air-conditioned rooms have floor-to-ceiling windows offering views of the city and Busan Marina. Each room is equipped with a 46-inch flat-screen cable TV and sofa. The attached granite bathroom has a 23-inch TV, separate rain shower and bathtub. 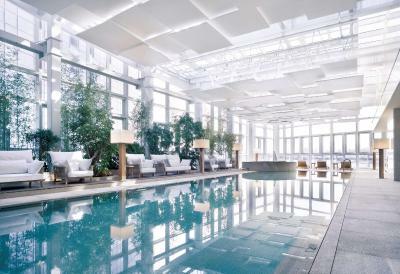 Guests can take a dip in the 20 yards indoor pool or relax with a massage at Lumi Spa & Fitness, which also offers seven treatment rooms. The hotel provides shuttle and limousine transfer services from the train station and airport at an extra charge. 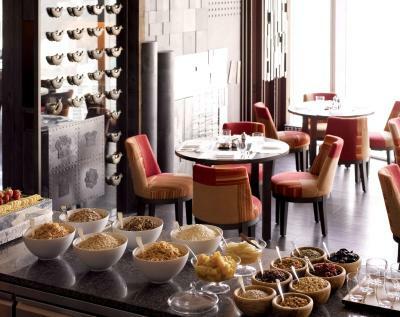 Breakfast is available at Dining Room, the hotel’s signature restaurant on the 32nd floor. 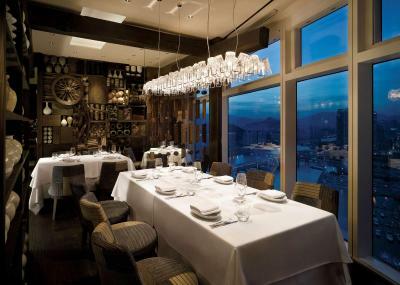 The Dining Room also features 3 open-style kitchens including a sushi and sashimi station. 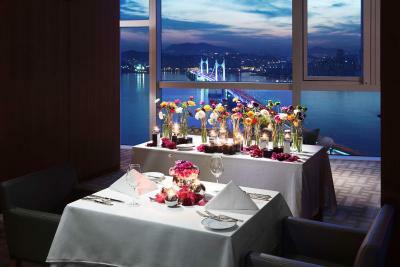 A selection of Western and Korean dishes are served at the Living Room on the 31st floor. 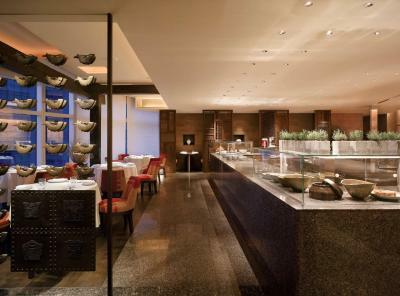 Park Hyatt Busan is a 4-minute drive to Nurimaru on the picturesque Dongbaekseom Island. 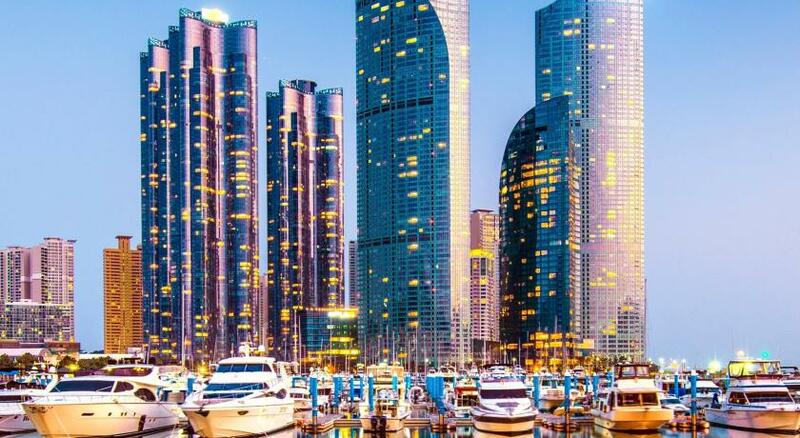 Busan Exhibition and Convention Centre (BEXCO) is a 5-minute drive away while Haeundae Beach is a 6-minute drive from the hotel. It takes 40 minutes by car (15.5 miles) to reach Gimhae International Airport. 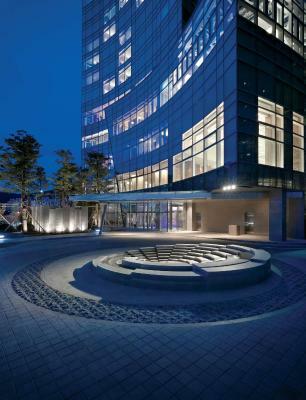 Park Hyatt Busan has been welcoming Booking.com guests since 2 Jan 2013. 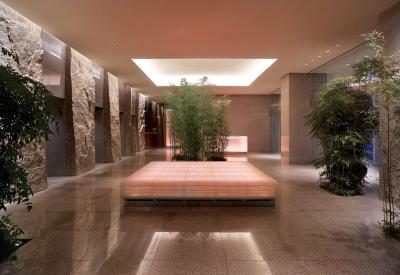 When would you like to stay at Park Hyatt Busan? Wood and textile decor in warm beige tones welcomes visitors to this 41 m² guestroom which comes appointed with one king bed and a dining table with seating for two. 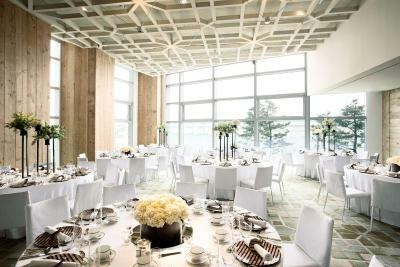 Floor-to-ceiling windows grant views of the ocean and Gwangan Bridge. A separate rain shower and bath, plus additional TV complement the bathroom's polished granite surfaces. Wood and textile decor in warm beige tones welcomes visitors to this 41 m² guestroom which comes appointed with two twin beds and a dining table with seating for two. 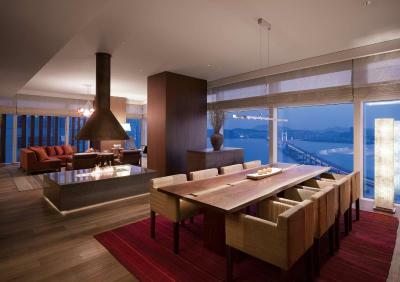 Floor-to-ceiling windows grant views of the ocean and Gwangan Bridge. A separate rain shower and bath, plus additional TV complement the bathroom's polished granite surfaces. Wood and textile decor in warm beige tones welcomes visitors to this 49.5 m² guestroom which comes appointed with one king bed and a dining table with seating for two. 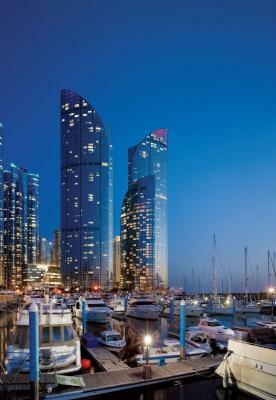 Floor-to-ceiling windows grant views of Busan Marina. A separate rain shower and bath, plus additional TV await complement the bathroom's polished granite surfaces. Wood and textile decor in warm beige tones welcomes visitors to this 48 m² guestroom which comes appointed with two twin beds and a sofa. Floor-to-ceiling windows grant views of Busan Marina. A separate rain shower and bath, plus additional TV await complement the bathroom's polished granite surfaces. Wood and textile decor in warm beige tones welcome visitors to this 36- to 43-square-metre guestroom, which comes appointed with one king bed and a couch seating area. 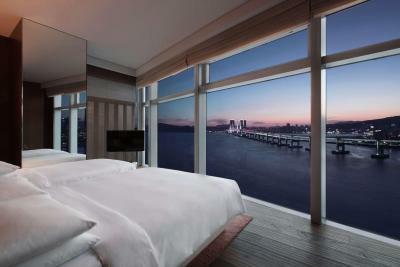 Floor-to-ceiling windows grant views of the city and Busan Marina. 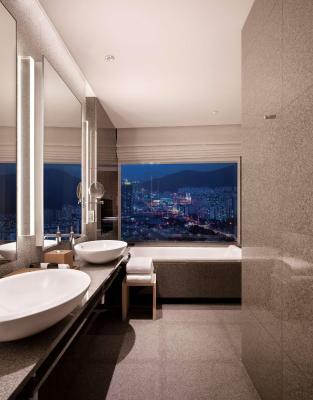 A separate rain shower and bath and TV await amongst the bathroom's polished granite surfaces. Featuring the landscape of Busan City and the yacht marina through floor-to-ceiling windows, this 81½-sq-m standard suite room comes with one queen bed and one single bed and bathroom has a bathtub. A separate lounge area with a dining table. This suite features a bathrobe, cable TV and seating area. Wood and textile fabric walls in a dark brown tone welcome visitors to this 77 m² corner suite which comes appointed with one king bed, dining table, and separate lounge area. 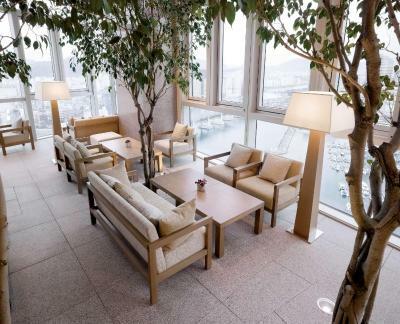 Floor-to-ceiling windows grant views of the ocean with Gwangan Bridge. A separate rain shower and bath, plus additional TV complement the bathroom's polished granite surfaces. Wood and textile fabric walls in a dark brown tone welcome visitors to this 67 m² corner suite which comes appointed with one king bed, dining table, and separate lounge area. 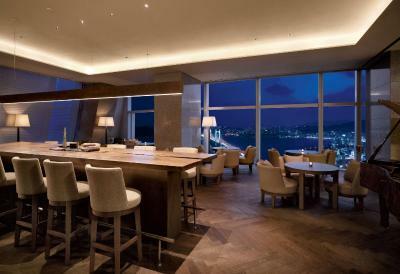 Floor-to-ceiling windows grant views of the ocean and Gwangan Bridge and Yacht Marina. A separate rain shower and bath, plus additional TV complement the bathroom's polished granite surfaces. These high-floor, ocean-view-rooms are located on the 17th through the 26th floors. Featuring views of the ocean and Gwangan Bridge through floor-to-ceiling windows, each room offers 41 sq m of space with one king bed. This double room has a seating area, air conditioning and cable TV. These high-floor, ocean-view rooms are located on the 17th through the 28th floors. 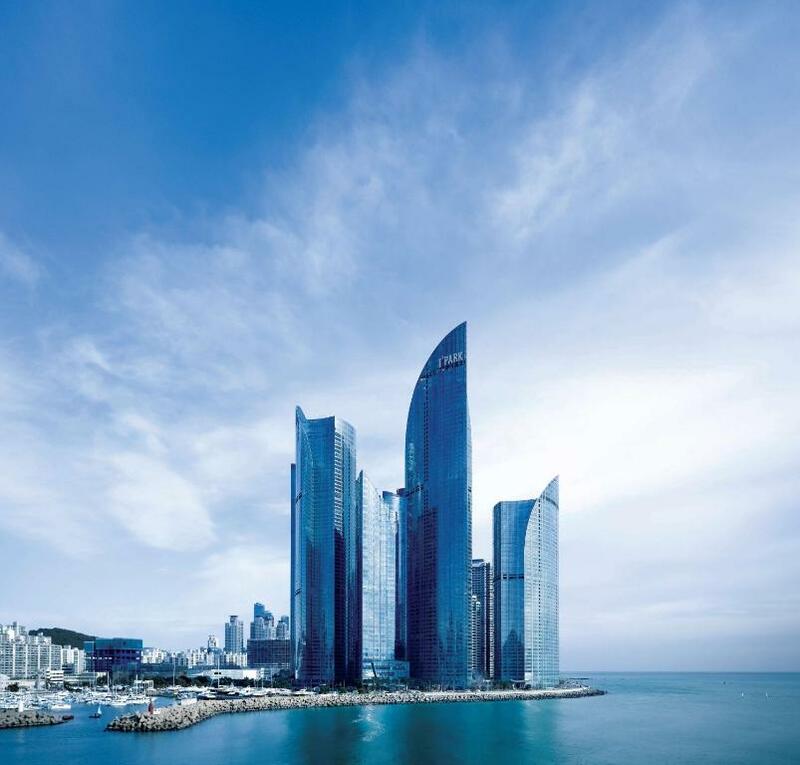 Each room offers 41 sq m of space with two super single beds, along with views of the ocean and Gwangan Bridge through floor-to-ceiling windows. This twin room has a seating area, bathrobe and air conditioning. 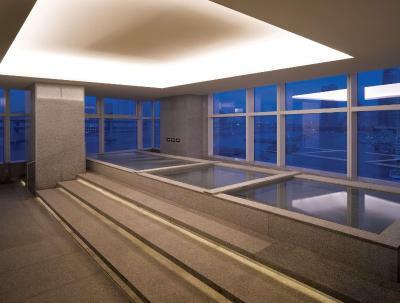 Featuring the landscape of Busan City and yacht marina view through the floor-to-ceiling window, this 81.5 sq.m. suite is equipped with 1 queen bed and 1 single bed. It also comes with a separate lounge area, a dining table and a spacious bathroom with a bathtub. 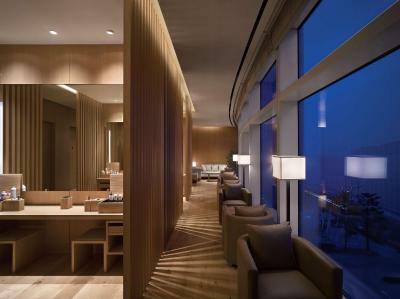 Occupying a dramatic oceanfront location offering scenic views of Gwangan Bridge and the ocean, Park Hyatt Busan provides 269 luxuriously appointed rooms including 69 suites equipped with the latest technology and all the luxury amenities a modern traveler could desire. 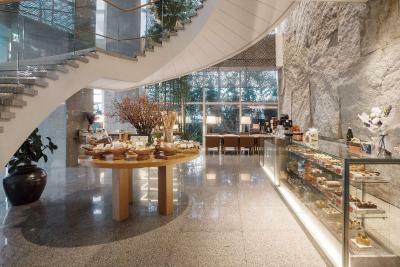 Implementing the concept of residential comfort, Park Hyatt Busan rigorously pursues nature-friendly materials such as granite and French oak hardwood, employed to offer a stylish yet comfortable atmosphere on top of the modern interior. 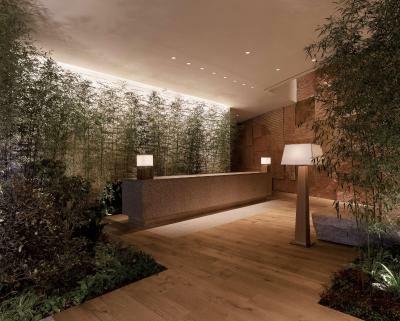 The guestrooms were designed as if the outside had been completely relocated indoors, guaranteeing that guests experience comfort and relaxation during their stay. The lobby, situated on the 30th floor, greets guests and is a place where they are immediately treated to a magnificent ocean view, even before checking in. 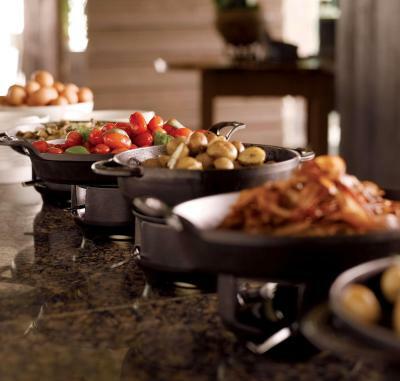 It is designed to leave every guest with an everlasting memory of their very first encounter with the hotel. 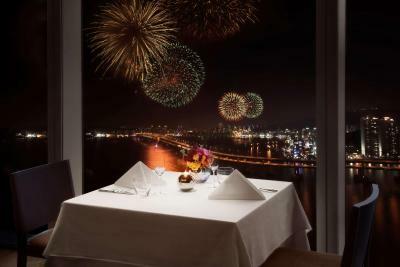 House rules Park Hyatt Busan takes special requests - add in the next step! All older children or adults are charged KRW 50000 per person per night for extra beds. Park Hyatt Busan accepts these cards and reserves the right to temporarily hold an amount prior to arrival. Guests must be 19 years of age or older to check in. An extra bed must be requested at the time of booking. It is subject to availability, and cannot be accommodated in Twin room types. Room service took a long time to arrive. Expensive food in the restaurant and room service and not many restaurants nearby. Good location for view but a long way from the centre and about 15-20min walk from station. Have to say this. Unbelievable and disgusting experience. Many hair in the bath tub and even secretion that normally comes from love affair. Need to clean things perfect since it is PARK Hyatt. Nice staff. Simple and morden atmosphere. The 20 minutes' walk to the subway. Coffee at lobby bar is too expensive. Excellent view and style. Very clean rooms with attention to detail. Location is good and quet. Well appointed room, excellent view and a good coffee machine.